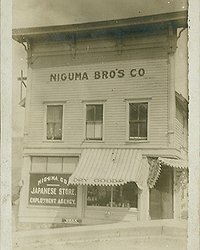 The Nikkei community of Hood River was one of the largest and earliest established Japanese communities in the state of Oregon. Agriculture has been a significant part of the culture which is still carried on today by many families, but this history required integration, struggle and perseverance. 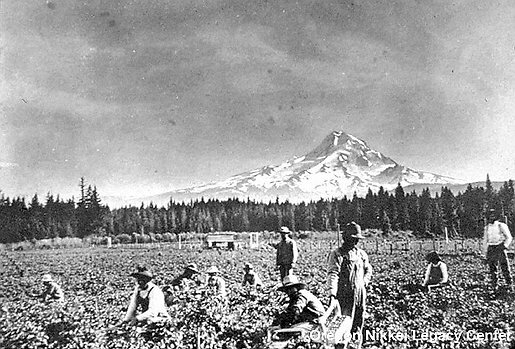 This collection is a brief history of Nikkei farmers of the Hood River area, presented by the Oregon Nikkei Legacy Center. Please contact ONLC for additional information. Thank you to the Nikkei families of the Hood River area, Linda Tamura, the Yasui Family, and the Hood River County Historical Museum for their participation in the original exhibition. 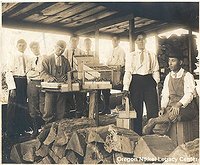 This project has been funded in part by the Oregon Heritage Grant. Hamada Family Orchard, Parkdale, OR, ca. 1920. 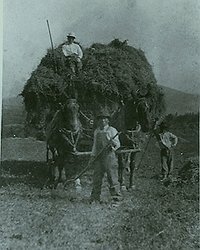 Some came from traditional farming backgrounds in Japan, but not everyone had experience. They took what work they could get. 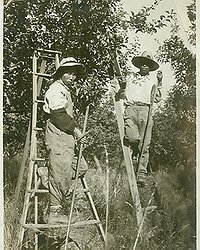 Mostly young, single men, the first Issei were employed at hard labor. Shinbo –- the Japanese principal of patience, endurance, and perseverance –- guided their paths. It takes about nine years for apple trees to bear enough fruit for commercial harvest. 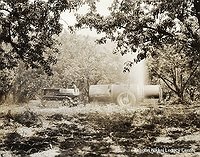 Families planted their orchards, and put in strawberries for quick cash crops. 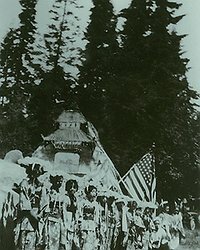 Completed in 1926, the Hood River Japanese Community Hall became a central place for community life. Plays, musicals, talent shows, Japanese picture shows, community meetings, Christmas and New Year's parties, Japanese School, and Japanese Methodist Church services were all held at the new facility. Fourth of July, Parkdale, Oregon, ca. 1935. 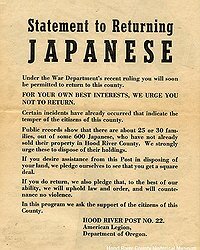 Some of the Japanese in the valley were at the Japanese Community Hall on Sunday, December 7, 1941, preparing for a variety show when news of the Pearl Harbor bombing came on the radio. Hood River, Oregon, 9:40 a.m., May 13, 1942. 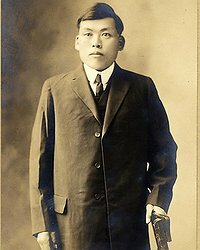 The McCarran-Walter Immigration and Naturalization Act passed in 1952, allowing Issei to apply for and receive American citizenship after so many years. Oregon_Nikkei — Última actualización Mar 02 2016 6:35 p.m.